For the past five years the most forthcoming institution by far has been the National Gallery in London (see right). 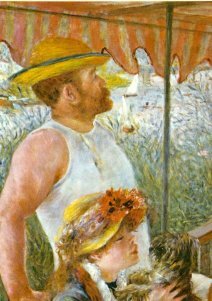 In contrast, the Neue Galerie in New York and the Phillips Collection in Washington DC have ignored all requests for information. 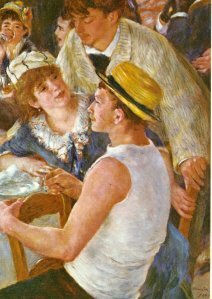 Our chief interest at the Phillips concerns Renoir’s great work of 1881, the “Luncheon of the Boating Party” which was bought in 1923 for a then massive $125,000. That museum’s continuing silence masks a long-running controversy that goes to the heart of twentieth century restoration practices. 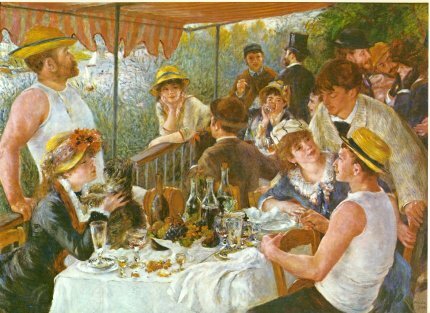 “In the 1950s, Mrs Keck and I attended a dinner party where an internationally known British connoisseur attacked the cleaning of paintings in general insisting that artists counted on the mellowing effects of time to enhance the harmony of their designs and colours… One of the other guests inquired whether the gentleman had viewed the Phillips Collection’s Renoir ‘Boating Party’ since it had been cleaned (by us, as most of those around the table knew). 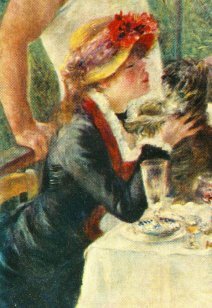 ‘It is ruined’, he said, ‘ruined…the harmony of the whole has been destroyed, the glazes have all been stripped away…I stood in front of it and I wept.’ Defence was undertaken by Mrs Keck and if she may have exceeded normal dinner party proprieties, her statements were eminently accurate. We had photographically documented the painting, even made a color movie of our cleaning, and every solvent swab used on the surface had been saved in large jars. Although Mrs Phillips spoke of a lining, not a cleaning, owners of pictures with blisters are often advised that lining with an additional canvas is needed to prevent the disintegration of paint and that cleaning is essential to this “cure”. Few owners openly admit injury to their own works, but lining is today widely recognised as an intrinsically dangerous combination of heat and pressure in which glazes get melted, brushwork gets flattened and pictorial values get irreversibly corrupted by invasive adhesives. 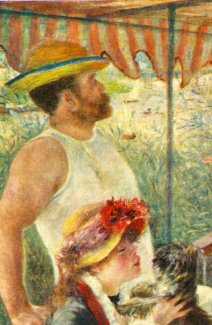 That the great Phillips Renoir has suffered from solvent-laden swabs is demonstrable today. Examination of the dark blue drapery of the young woman in the bottom left-hand corner of the picture shows that dissolved red paint from her (now smeared) costume’s trim has been rubbed into the paint cracks like coloured ink on an etched plate. 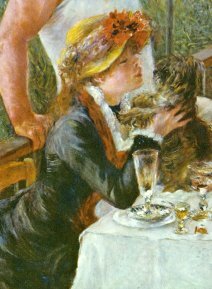 Renoir could not have rubbed dissolved paint into age cracks on his own fresh paint – so who else might have? Nor was it he who smeared the red stripes on the awning. Why, then, will the Phillips permit no-one to view the film of which Sheldon Keck boasted but of which Duncan Phillips himself spoke so remorsefully? 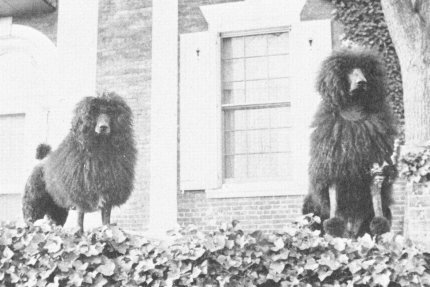 Above, the Phillips’s poodles C’est Tout (left) and Ami. 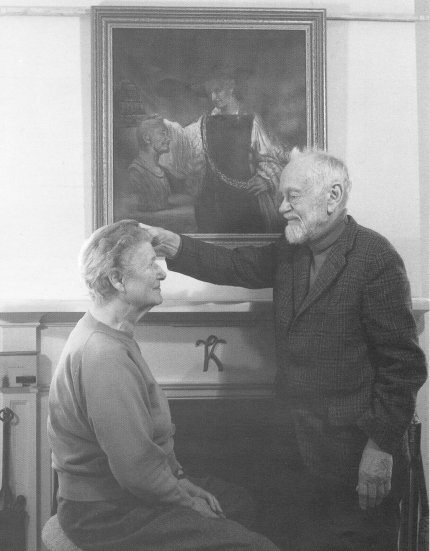 Above, Caroline and Sheldon Keck emulate Rembrandt’s “Aristotle Contemplating a Bust of Homer” in front of a monogrammed fireplace. 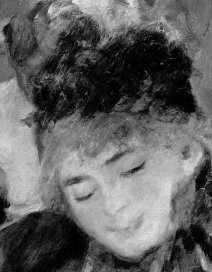 Above, a detail from the National Gallery’s Renoir “The Umbrellas” before cleaning in 1954 (left), and after cleaning (right). The cleaning was preceded by a physical and a chemical analysis of “minute fragments of paint taken from opposite edges of the picture” by two gallery scientists. They concluded that an “extremely thin” natural resin varnish could be safely removed “by solvents of a strength well below that likely to attack the paint film, which is resistant to the solvent action of pure acetone.” So confident were the scientists, they offered to the gallery’s trustees (who must approve all restorations), an additional, explicit assurance: “In the hands of a competent restorer [in this case, Norman Brommelle was chosen] there is no reason to fear that the paint layers will be disturbed in the course of cleaning. Since in this particular picture, there is no evidence of a linoxyn film, nor the presence of any resin in the medium, there is, in our opinion, no need to adopt any special precaution.” Norman Brommelle reported that the varnish was removed with a 3:1 turpentine/acetone mixture containing a small percentage of diacetone alcohol and that the last traces were removed with toluene. (Technical information by courtesy of the National Gallery Conservation Department.). 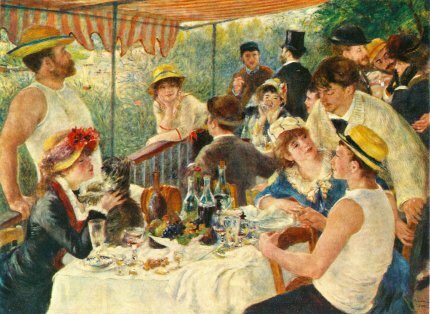 Above, a printed reproduction of The Phillips Collection Renoir “The Luncheon of the Boating Party”, before its restoration in 1954 by Sheldon and Caroline Keck. Below, a printed reproduction of the same picture, after its 1954 restoration. 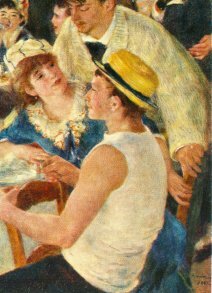 Below, details of “The Luncheon of the Boating Party”, before cleaning, on the left, after cleaning on the right. Click on the images for larger versions. NOTE: zooming requires the Adobe Flash Plug-in. It should be noted that the photo comparisons here are greatly handicapped by the museum’s lack of cooperation. 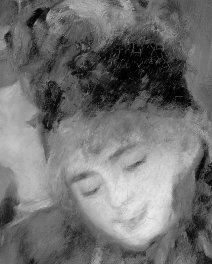 These are confined to reproductions of published reproductions where the quality of resolution in the older pre-cleaning state is markedly poorer than that found in the later, post-cleaning, photograph. This entry was posted on January 8, 2011. It was filed under blog.